At one time, standard roses were budded on the rambler, IXL. The benefits are IXL flows a great deal of water, so longer or taller lengths are possible than with the current Dr. Huey stocks. IXL forms very thick canes, often an inch or more, in a very short time and it grows them VERY long. It roots quite easily and accepts most scions. The downsides are the enormous amount of room necessary to maintain mother blocks of it for commercial production and the ease with which it can sun scald under extreme conditions. I chose to use IXL to produce standards for my garden because I want/need stronger, thicker trunks to help against the high winds we can experience here on this hill. I want to bring some of the seed parent breeders I like to use higher up, so I can see them better and not have to kneel or sit on the ground to work with them. I hope bringing the hips up higher will also help keep the vermin from eating them before I can plant them! I collected three dozen, quite thick, cuttings from a very long whip of an IXL I had given to my brother in law many years ago. Some of them were only six or so inches long. Most were a foot and a half or longer, with the longest measuring a full four feet. The ones intended for standard trunks had all growth buds except for the top one or two sliced out of them with a single edged razor blade. I processed them with my aforementioned rooting hormone of choice and wrapped them, as before, in the damp newspaper. Two, large, black plastic trash bags were used, one from each end, to wrap the bundle of "burritos". These were wrapped around and tied loosely to maintain the dampness inside. This wrapped bundle was then placed on a shelf inside the storage room attached to the garage where it remained cool for the two week period. At the appointed time, I unwrapped them and found this. These were all potted in one and two gallon cans. The larger ones have been staked and tied to secure them in the pots to prevent wobbling. Root formation requires good soil to cutting contact. Should the cuttings wobble in the soil, rooting could be delayed or even prevented. Those intended to create new mother plants, complete with all bud eyes left in them, were potted as the earlier cuttings were. 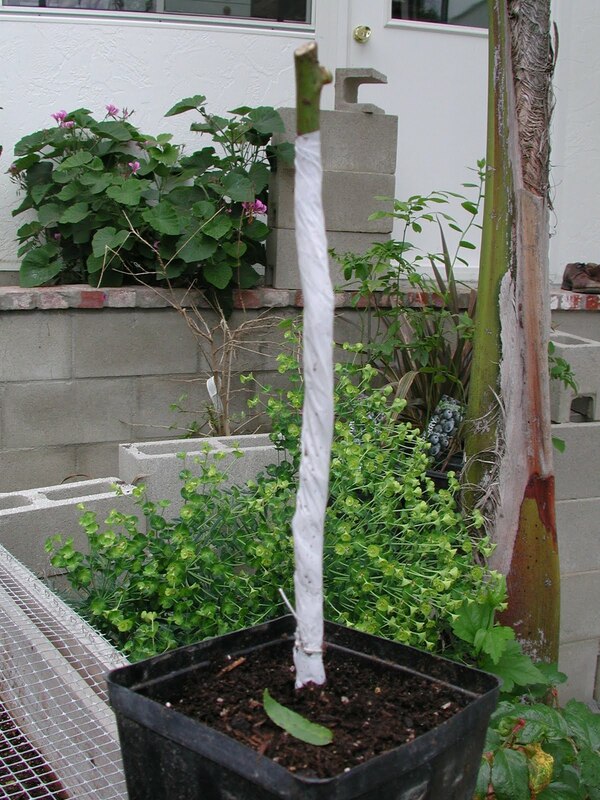 Those with the growth buds removed, intended for stocks, I wrapped in strips cut from white kitchen garbage bags. Twenty-five plus years ago, when I was volunteering at The Huntington Library propagating roses, I developed a method of rooting these longer cuttings for standard stocks. This is where wrapping the trunks in the white plastic came from. The plastic retains moisture in the cane while it roots. The white plastic permits light to absorb into the green wood so photosynthesis may continue, feeding the cutting while it develops. Here, without mist, I figured using the white plastic strips to wrap the stocks, leaving the tops exposed, would permit them to grow with less chance of rot. I tucked the pots among the others in my "pot ghetto", figuring the surrounding foliage would provide extra humidity, much as poking a cutting into the soil under the mother plant would. It's been almost three weeks since these were removed from the paper and potted. As you can see, the combination of all that was done has permitted them to begin growing even faster than the first batch of smaller ones did. I believe the extra heat of the past few weeks has probably helped. Once I can see root formation in the pots, I'll begin loosening the plastic wrappings to harden them off. By next spring, I should have a number of stocks suitable for budding. oh my goodness, Kim--Jim has been wanting to try tree roses for forever! Thanks so much for this fun and enlightening article! I can hardly wait to show it to him! I was so excited to see this post as Jim has for a very long time wanted to try his hand at standard roses, and we have wondered how to start the stock. Don't know if it will work, but we have an old Cl. Queen Elizabeth that throws huge, straight canes and we may give them a try with this method to see if this variety will root as well as the IXL stocks you used (what is IXL anyway???). Sure looks fun! Hi Sally, the major disadvantage of using the Cl. Queen Elizabeth is you have no idea whether it is virused or not. If you use something that is Virus Indexed, you at least have some indication, some hope that you won't be introducing virus into the rose you're budding on to it. I guess this is most important when working with seedling roses which shouldn't be virused. You can practice rooting the Queen Elizabeth canes to become proficient at it, and even practice budding on them. I don't know how long a life they might have used as stocks. IXL is a rambler released in 1925 and is a cross of Tausendschön × Veilchenblau. It's nearly thornless, roots quite easily and creates enormous growth quite quickly. You do have to take precautions against sun scald, but the vigor it imparts to scions and its longevity makes that a minor issue for home use. Thanks Kim this is exactly what I was looking for! Wonderful, Bekah! I'm glad I could help! You'll have a ball with them. I am. Can I keep potted and callused cuttings indoors until winter frost has gone?